Allergy is an increased or distorted sensitivity of human’s body towards any allergen i.e. substance that causes allergy. The reaction for the allergen occurred may be in the form of immediate hypersensitivity or delayed type. An allergy is the basis or in other words stronghold of the so-called allergic diseases (eg, asthma, hives or dermatitis). 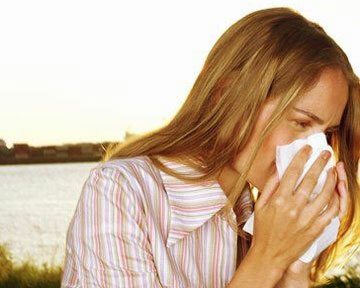 It is well known that allergy is an indicator of disharmony caused by improper diet and unhealthy lifestyles of people. The causes of allergy can also be like excessive consumption of refined and processed foods being overloaded with numerous chemical additives, as well as emotional or psychological stress going on once in a while on a continuous basis. Allergens may be also a kind of reaction upon some medicines, household dust, pet hair and even washing powders. The symptoms demonstrate themselves in various organs of the human body and in various forms such as: recurrent headaches, migraines, dizziness, nervousness, depression, neuralgia, conjunctivitis, eczema, hay fever, rhinitis, diarrhea, vomiting, asthma, difficulty breathing, swelling of the face and eyelids. It is important to be aware that the same allergens can cause different symptoms in different people at different times. Take one tablespoon of the large one celandine and add 2 cups of water to be boiled within. Then push for 4 hours so that it a consistent liquid stuff will occur. Drink in a quantity of 1/4 of a cup just 15-20 minutes before meals in morning and evening. When you have higher reactions to pollen which is more frequent in July and early August it is strongly recommended when coming home from the street to rinse the throat with plain water or with the addition of soothing herbal extracts of Leonurus or valerian in any concentration. It is also good to take a contrast shower at least 3 times a day. To a person who suffers from allergy it is important for full recovery in order a change the reaction of the body to drink for a few months instead of tea and coffee only fresh broth which is specially prepared. Brew it like tea and let it boil for 20 minutes. Color broth should be golden and if it muddy or green it means substance is so far unsuitable for use. Broth can not be stored for a long time it should be drunk as soon as it was prepared. The bur marigold is better to collect yourself or buy fresh in a drug store to be dried in a dark place. Prepare a tincture of Spiraea (Filipendulae ulmariae)flowers to be poured in a quantity of one tablespoon of it to 500 ml. of boiling water and insist approximately for 10-15 minutes. Drink a stuff made in the from of one tablespoon for 3-4 times a day. As a rule, allergy is slightly starts reducing it’s effect and only a few months of treatment may give a complete recovery result. One of the best treatments for allergy is a mummy remedy. But we need to select mummy of high quality for that. The procedure is rather simple i.e. dissolve it in the following proportions: 1 g. of mummy to 1 liter of warm water. Note that a good mummy is dissolved without any appearance of the precipitate. You are to take the prepared solution once a day in the morning and drink it together with warm milk. Dosage: Children 4-7 years to 70 ml, 8 years and older – 100 ml. Effects of mummy is usually rather rapid. The course of treatment have at least 20 days in spring and autumn. To prevent or overcome allergy negative effects you should first improve immunity. This seems to be a rather challenging task to be performed well according to Indian doctor X. K. Bahru. At first you are to have a four or five-day juice fast i.e. just drink a lot of juice so that to achieve better stability to the acquired allergy. After the juice diet patient can move to monodiete consisting of fruits and vegetables such as carrots, apples and grapes which should be carried out not more than a week. Following this, monodiete may be added a second food product in the third, etc. At the end of the fourth week of the diet protein products are introduced. At the beginning of the diet you should exclude tea, coffee, chocolate, alcohol, sugar and products thereof, peeled cereals, meat, fish, milk, cheese, butter, smoked meat, spices and in future use them very sparingly.